Macworld reports that Apple has added a new ‘download later‘ prompt to large media purchases “such as movies, TV shows, TV Season Passes, full TV seasons, movie bundles, and music box sets” made in iTunes or on the mobile iTunes Store. When purchasing any of the above items using iTunes 11 on a Mac or Windows PC, or an iOS device running iOS 6 or later, you’re now presented with Later and Download (or Download All) buttons. Tap Later and the purchased items will be added to your iTunes account and accessible to stream or download in the future via Apple’s iTunes in the Cloud feature. It’s a handy feature if you, say, want to buy a movie on sale while you have a spotty data connection; you can make sure to get the cheaper price, then download the item when you get home—or even just play it from the cloud. 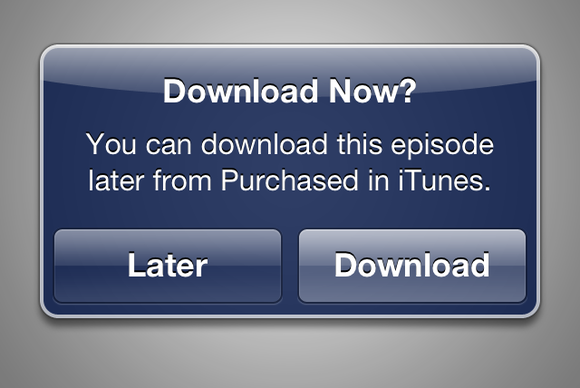 The “Download Later” option only works for users in countries that support iTunes in the Cloud for the type of media they are purchasing.